As we all know, home staging benefits empty properties, new builds, developments and properties that are in need of a new image. One of the most unique companies that specialise in maximising these properties’ potential is London-based Yohan May Interiors. Yohan May was founded in 2015 by two friends, Michele Atijas and Amber Friederichs. At the time, Michele came from the financial industry and had recently completed a course in interior design and Amber was already in the business as a project manager for renovations, looking for the next challenge. They came up with the business idea on one of their many ‘get-togethers’ when Amber was selling one of her projects and was looking for a Home Staging agency. She had found the prices to be quite high and the quality of furniture relatively low and, as property is expensive in London, you need to make use of quality pieces to reach its maximum selling price. With a few years’ experience in the US, where the home staging industry is fairly advanced, Amber knew the positive impact staging has in terms of selling a property faster and for higher than asking price. Both girls set out researching the marketing potential of launching a Home Staging business in the UK, a market that is far less aware of the concept and its benefits. They spoke with many developers and real estate agents and were met with overwhelming positive response. 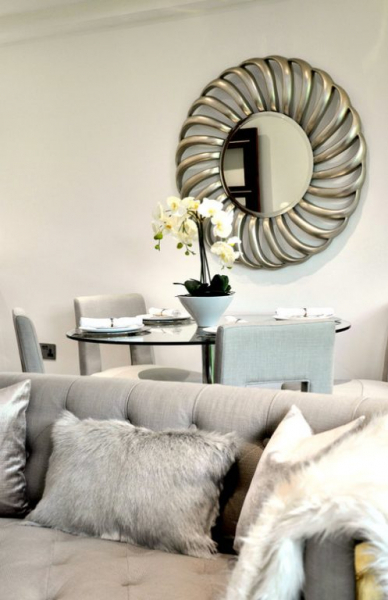 Within the first month of launching their company they had several enquiries and completed a penthouse flat in Fulham and a luxurious mews house in Notting Hill. When coming up with a name for their new home staging company, the girls spent some time brainstorming their brand and how they wanted to represent themselves. They came up with Yohan May with a very nice backstory which is quite special to the girls: Yohan is representing Amber’s late father Johann, and May is representing Michele’s late mother Maj, both of whom they inherited their passion for interiors and their taste. Specialising in home staging and styling is quite different from completing an interior design project for a client, in the sense that home staging focuses on optimizing the space rather than the furniture or soft furnishings. Yohan May have been focused on Home Staging from the beginning as Amber and Michele saw a gap in the market, and the service that they offer is geared towards showcasing a property at its best potential, highlighting to the right areas from a potential buyer’s perspective. It is quite an art adding just the right amount of furniture and accessories without cluttering. When it comes to finding the right accessories for each project, Michele and Amber always look for accessories that suit the style of the property and the concept. Amongst their favourite items to use are luxurious coffee table books, high quality faux florals and plants, branded scented candles and other items that bring a narrative to the space, such as a drinks arrangement with faux olives or a book styled open, all of which add an inviting ambience to the space.